In January 1793, Nelson had not been very impressed at the news that he was to command a 64 gun ship-of-the-line (battleship) because he believed that his seniority entitled him to a 74 gun ship which, at the time, was the standard battleship common to most European navies. But, HMS Agamemnon had certain qualities that appealed to him and after a couple of weeks with the ship and it’s crew he withdrew his request to the Admiralty for a larger vessel. Agamemnon had just completed a major refit which included the addition of the new idea of a copper-sheathed hull which made her faster and more agile than other battleships. Nelson quickly realised that here he had a ship that performed like a frigate but carried the armament of a battleship; what is more, Captain and crew had taken to each other and it was clear to Nelson that this was too good an opportunity to waste. Thus, in 1793, Nelson and Agamemnon joined the Mediterranean Fleet under Lord Hood. By the beginning of 1795, command of the Fleet had transferred to Admiral Hotham and it was on the 8th. 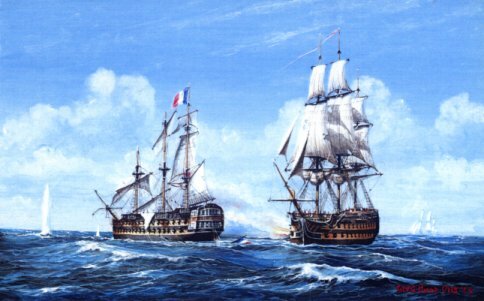 March that Hotham heard that the French Admiral Pierre Martin had sailed fifteen ships-of-the-line from Toulon protecting a troop convoy intending to invade Corsica. Hotham led his fourteen ships in pursuit. Within a few days, the two fleets were in sight of each other. The French, seeing the British ships under full sail bearing down upon them decided to withdraw as quickly as they could but, in the confusion, two of them, the “Ça Ira” and “Jean Bart” collided causing each other much damage in their masts and rigging. The 84 gun “Ça Ira” lost way and two other French ships went to take her in tow. This was a chance Nelson couldn’t ignore. He pulled away from the British Fleet and headed straight for the damaged enemy ship. The agility of Agamemnon and her well-drilled gunners gave Nelson a fighting chance that he could put his 64 guns against 84 guns but much depended upon his ability to keep Agamemnon clear of the heavy broadside bombardment that “Ça Ira” was still quite capable of firing. An 84 gun battleship delivered enough firepower from a single broadside to wreck a smaller ship and Nelson knew very well that he was gambling with disastrous consequences if his tactics went wrong. “At a quarter to eleven a.m., being within one hundred yards of the “Ça Ira’s” stern, I ordered the helm to be put a-starboard and the driver and after sails to be braced and shivered,” recorded Nelson afterwards, “As the ship fell off, gave her our whole broadside, each gun double-shotted. Scarcely a shot appeared to miss. The instant all were fired, braced up our after-yards, put the helm a-port and stood after her again. This manoeuvre we practiced till one p.m., never allowing the “Ça Ira” to get a single gun from either side to fire on us … At this time the “Ça Ira” was a perfect wreck, her sails hanging in tatters, mizzen topmast, mizzen topsail and cross-jack yards shot away.” For two hours Nelson and Agamemnon sailed back and forth astern of the enemy ship and each time they crossed it’s wake they fired a full broadside into it’s stern. There was nothing the larger ship could do to escape this relentless onslaught and, for a while, it looked as though “Ça Ira” had no choice but to strike her colours to Nelson but Admiral Hotham could see French ships sailing to the aid of their hapless countrymen and he signalled Captain Nelson to break-off his attack. This incident greatly impressed those who had witnessed it and it was a clear demonstration of the standards of initiative, seamanship and gunnery that the future Admiral Nelson would one day expect of every ship under his command. Agamemnon had suffered no casualties or damage in the engagement but the following day the “Ça Ira”, in the tow of “Censeur”, were both captured by Admiral Hotham’s ships and Nelson sent Lieutenant George Andrews across to accept their surrender. It was only then that they saw the terrible destruction inflicted upon “Ça Ira” on the previous day. French casualties were estimated at 400 killed and wounded and the ship was seriously damaged. Neither Nelson nor anyone else took any comfort from this and, not for the first time, they must have wondered why enemy captains sometimes seemed ready to let their crews suffer such appalling casualties. After all, the mutually accepted act of striking colours was intended to give captains, on all sides, the chance to end the engagement, and hence the casualties, once they were no longer able to defend themselves. “I wish to be an Admiral and in command of the English Fleet; I should very soon either do much, or be ruined. My disposition cannot bear tame and slow measures. Sure I am, had I commanded our Fleet on the 14th., that either the whole French Fleet would have graced my triumph, or I should have been in a confounded scrape … Now, had we taken ten sail and allowed the eleventh to escape, when it had been possible to have got at her, I could never have called it well done”. These were prophetic words. Little more than three years later, he had achieved the rank of admiral and, indeed, commanded an English Fleet. The wreckage strewn around Aboukir Bay in the aftermath of The Battle of The Nile proves how passionately he had meant every word he had written.